This is the story of a collaboration. A collaboration between different people, a company, and an institution. A collaboration characterized by smiling faces. Jonas Elmiger is someone who, if he was working in high-end gastronomy, would be labelled one of the “young and wild”. A young man, always on the move, always working on a project, and always giving 100%. In his cellar, Jonas welds custom frames for racing bicycles, or constructs a holder for his surfboard, so that he can strap it to his motorcycle and head out to a Swiss river to catch the next wave. Seeing him ride down a Bolivian or Columbian mountain pass, or coming down from Lucerne’s Michealskreuz, on his street surfing longboard is almost scary. Clearly, this young, curious man has many talents – and he has always been fascinated by watches. 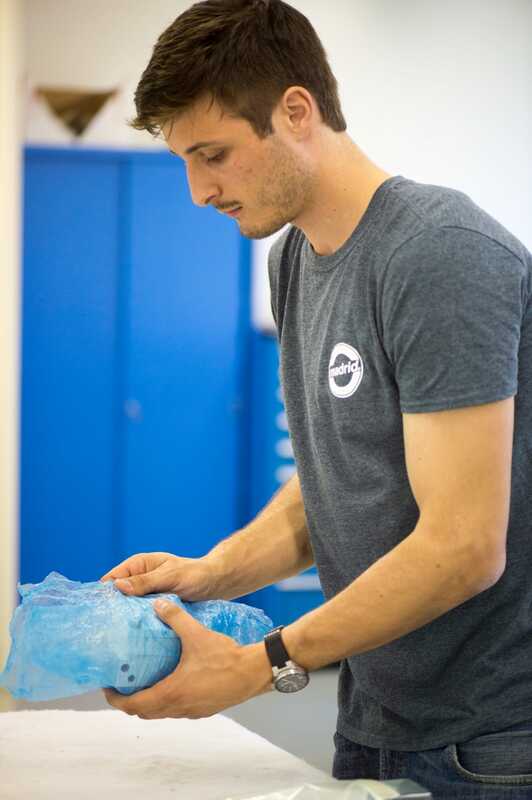 Having successfully completed a professional apprenticeship as polytechnician, Jonas Elmiger has studied mechanical engineering at the Lucerne University of Applied Sciences and Arts for the past 3 years. He decided that his Bachelor thesis should be more than a purely scientific theoretical paper; it should also be something for the heart and for the wrist. One day, he appeared on our doorstep and asked whether I might consider collaborating with him on his Bachelor project as an industry partner. Jonas fits our framework of requirements: high ambition, obligation to ethical standards and to the principle that it’s more important to follow through with a worthwhile idea than to reach your goals with as little effort as possible. 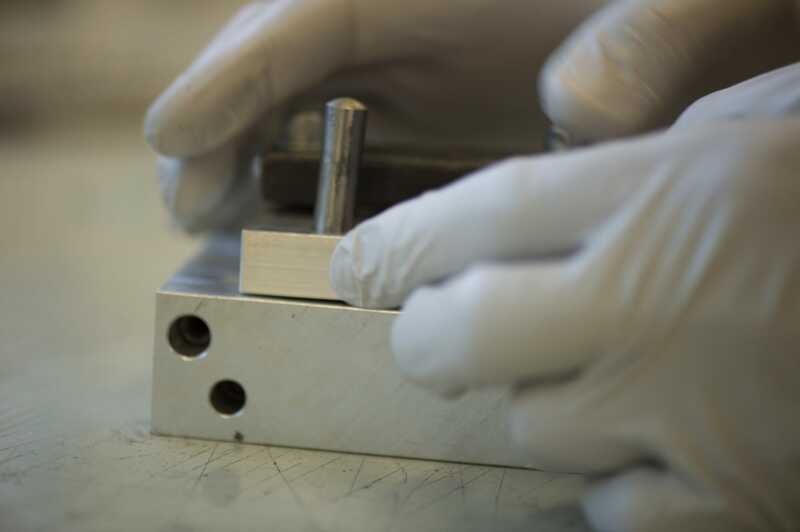 The Lucerne University of Applied Sciences and Arts possesses a suite of fantastic machinery, including equipment for ultrasonic milling, which can be deployed on five axes. Therefore, the project was to be something difficult, something challenging. Ludwig Oechslin’s designs, with their reduction of parts, offer themselves for a possible interpretation as lightweight constructions. The goal set for this thesis was to manufacture five usable prototypes for a carbon case, and to do this using the same case geometry as drawn by Ludwig Oechslin. 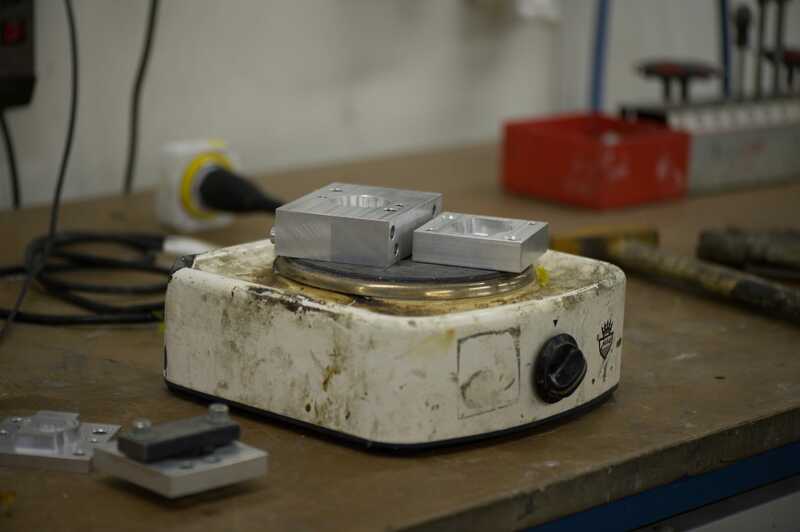 Instead of using ochs und junior’s tried-and-tested production method, namely machining and milling the cases from solid blocks of metal, the idea was to laminate the carbon case and to bring out its structure by means of an autoclave using heat and a vacuum. 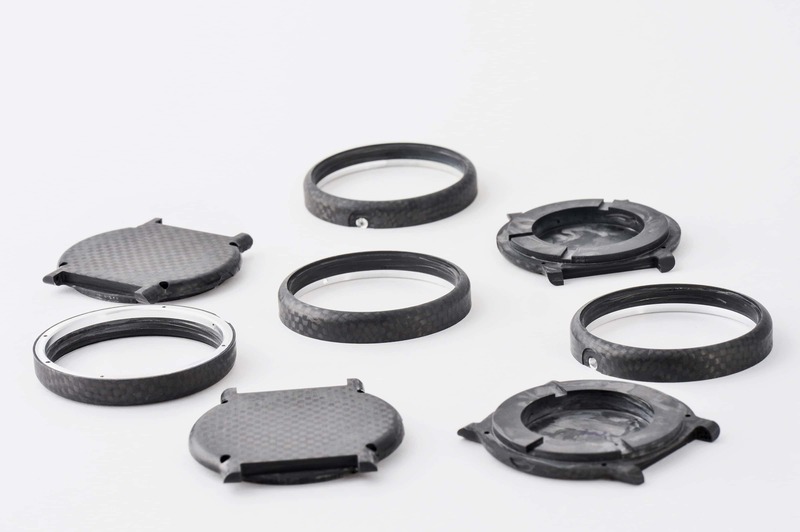 In the captioned images beneath this article, Jonas describes the production steps that resulted in his carbon case. On January 15, 2016, we graded Jonas’ Bachelor presentation together with Professor Ralf Legrand, Jonas’ mentor for this thesis. Jonas has brought his project to a successful close. 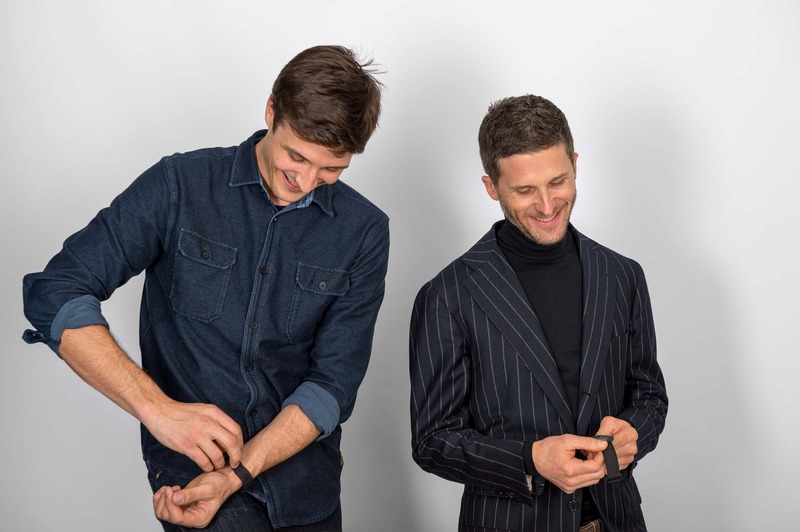 As a result, ochs und junior will officially offer one watch from this project for sale, as a unique specimen and a prototype. 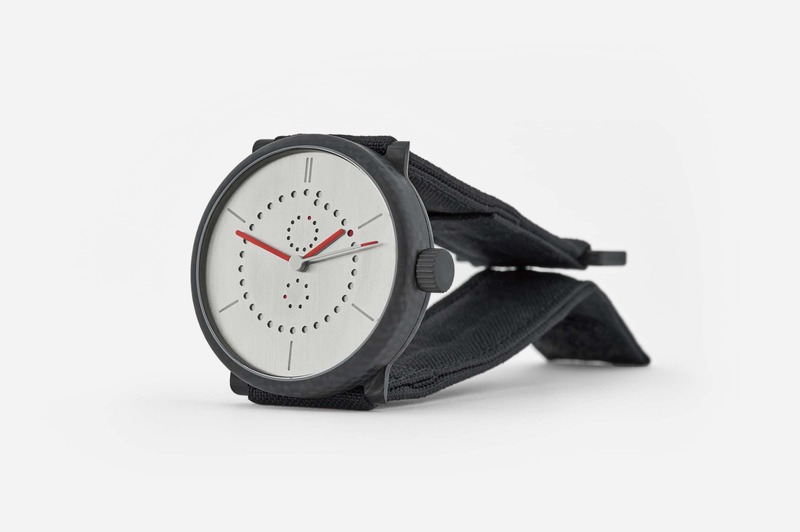 This is it, the one and only watch from Jonas’ project that is up for sale at ochs and junior. 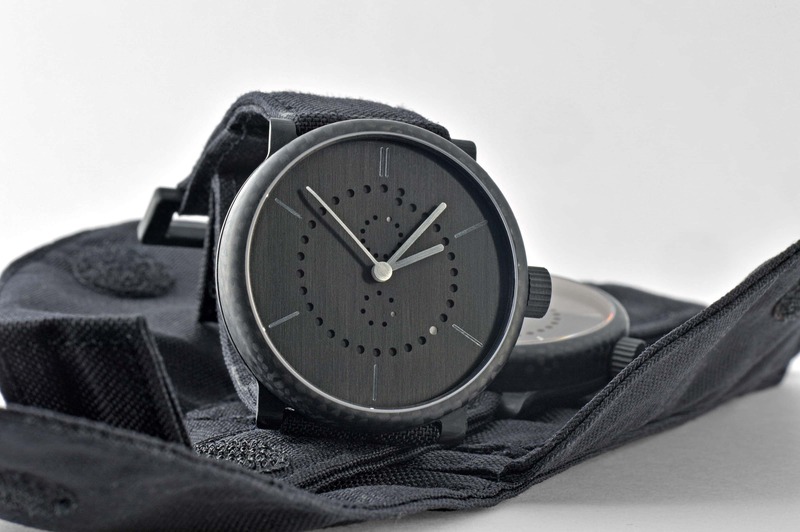 This watch is a true lightweight construction: it weighs a mere 35.3 grams and is extremely comfortable to wear. 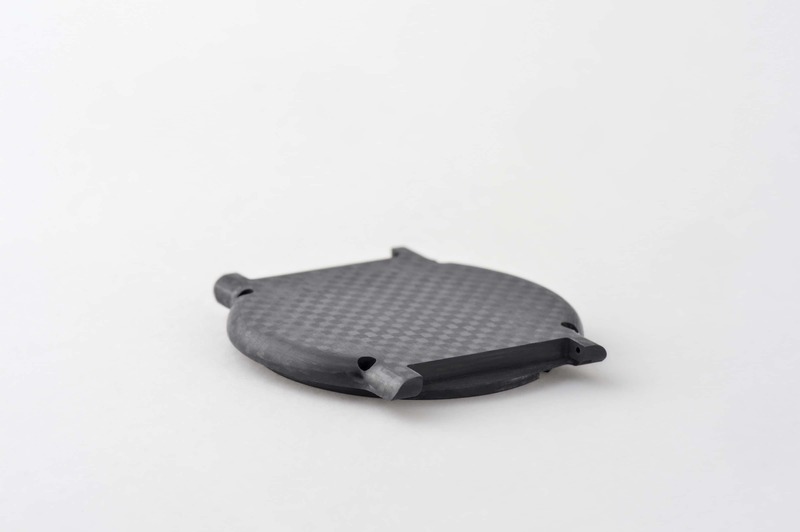 The two-part case consists of laminated carbon. The weight of the complete case is just 9.3 grams. Peter Cantieni manufactured the functional dial for this annual calendar watch from aluminum. The same applies to the date, month and weekday discs. The three hands, too, are all custom-made by hand from this light material. 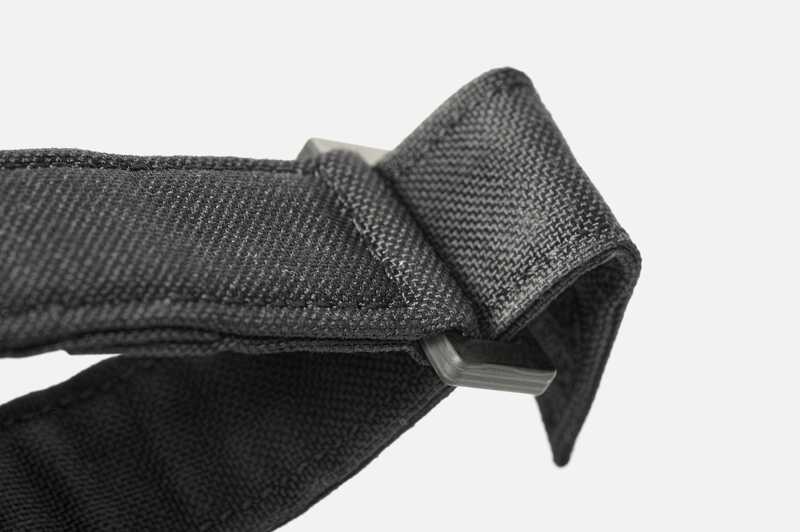 Our textile and leather expert, Sabina Brägger, has developed a strap with a Kevlar core – the same material used for bulletproof vests – surrounded by a high-tech fabric which is normally used for working clothes. 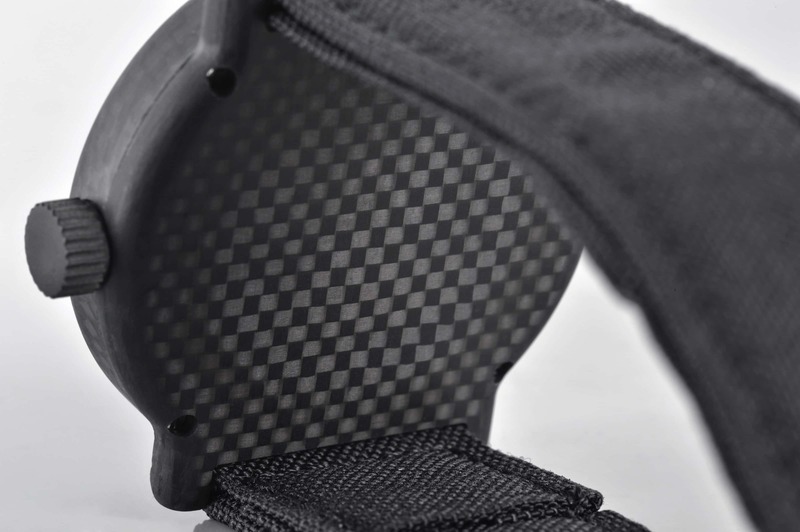 Consistently, the strap is closed around the wrist with Velcro and a carbon buckle. Everything, up to the textile travel pouch, has been designed to be as light as possible. This watch is truly a unique piece. 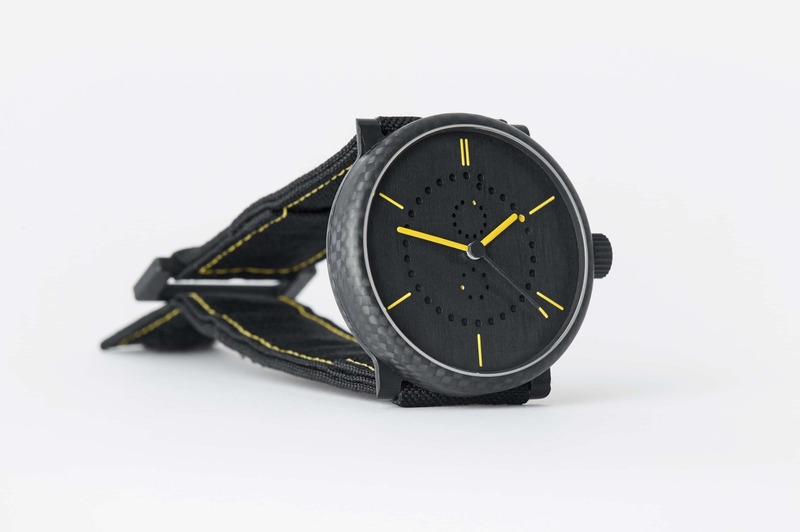 Once this one watch is sold, there will not be another one from Jonas’ project. The execution of the aluminum dial can be customized according to the buyer’s wishes. We recommend a lightweight design that matches the watch. 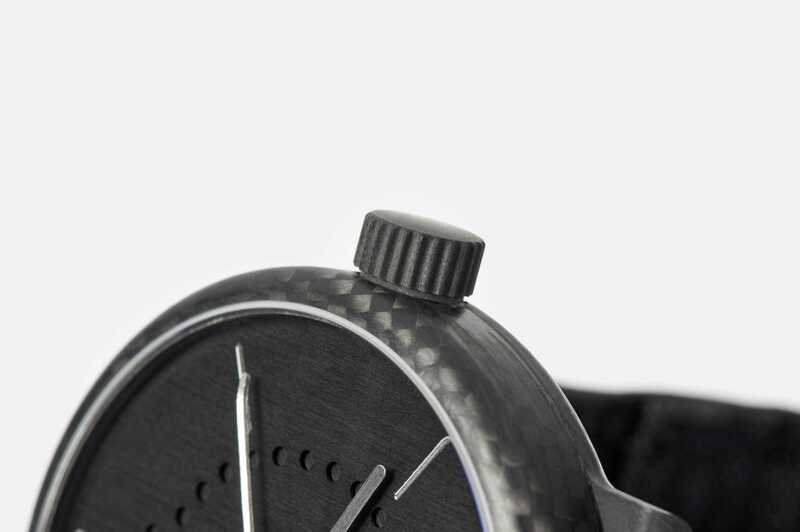 If the dial is anodized, no “weighty” color layer needs to be added. We are open for individual wishes and look forward to the discussion. A lightweight construction which is extremely comfortable to wear. We recommend keeping the watch away from water. Otherwise, almost anything can be done. 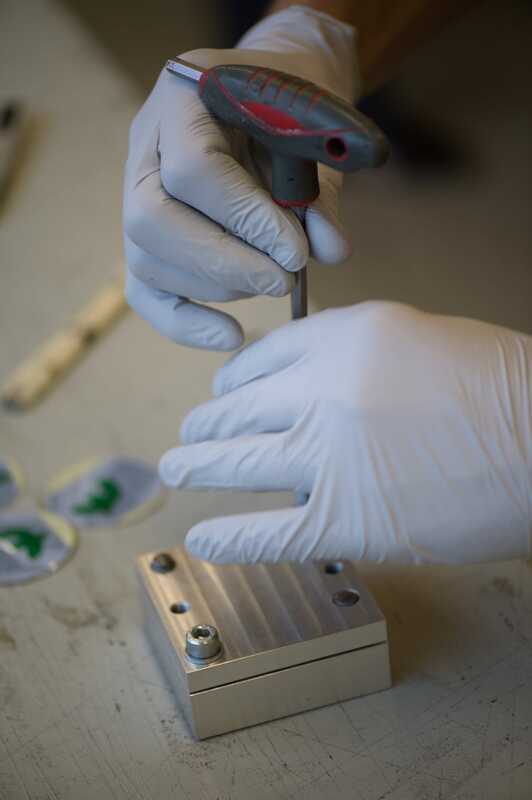 We provide a lifelong warranty on all parts made of aluminum. The watch is accompanied and documented by a print-out of Jonas Elmiger’s Bachelor thesis. The delivery time is 8 to 12 weeks, depending on the customization wishes. 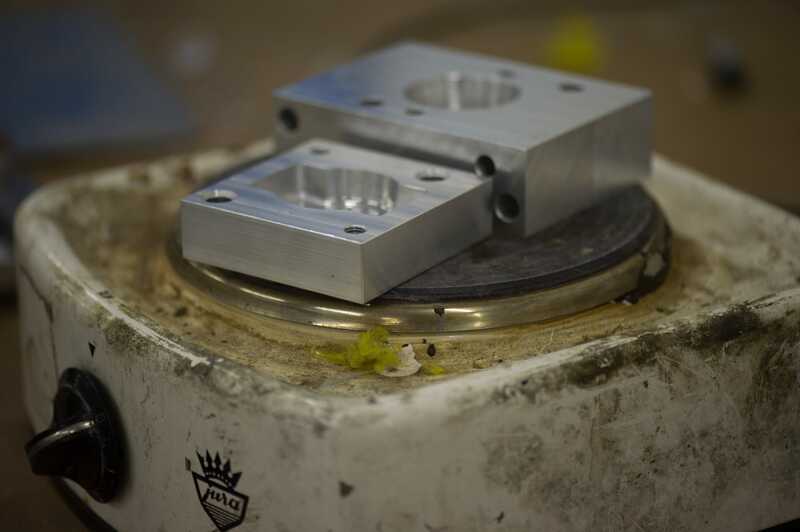 Warming the pressing molds before placing the carbon inside. 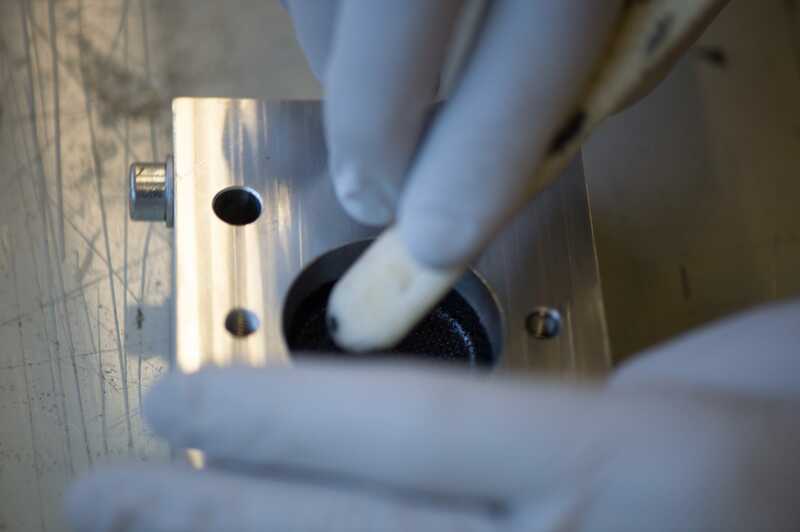 Warming the pressing molds before placing the carbon inside (closeup). Carbon cuts used to laminate the case back and the bezel. Screwing together the two-part mold for the case back, into which the carbon mesh has been laminated. Inserting the carbon mesh into the negative mold of the bezel. 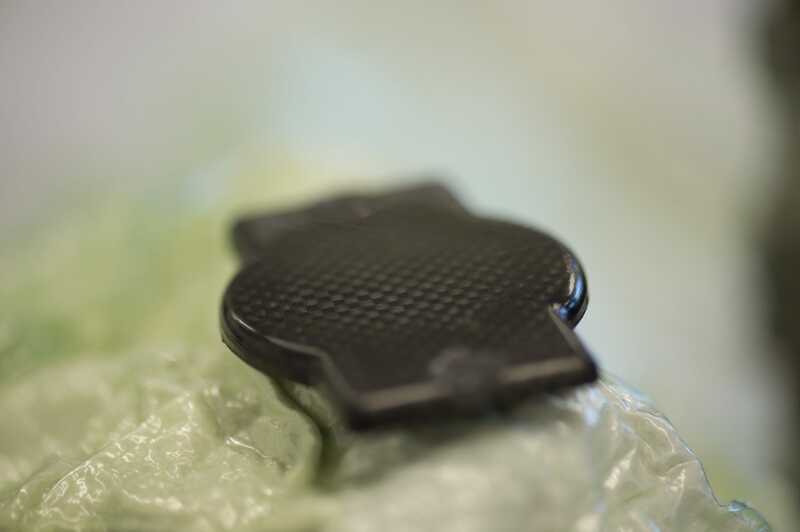 The first layer of Prepreg carbon mesh in the negative mold of the bezel. Assembly of the different parts of the bezel mold using dowel pins. 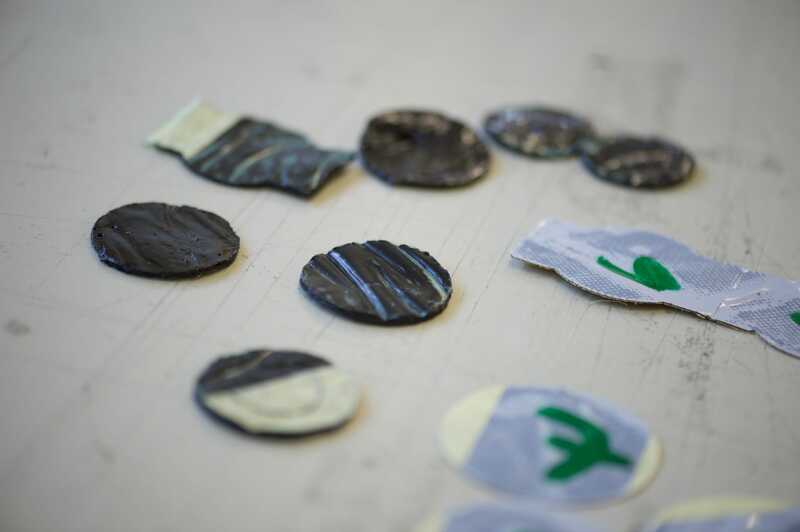 The molds, now screwed closed, are wrapped in separating foil to assure that any escaping epoxy resin does not stick to the bleeder fleece. 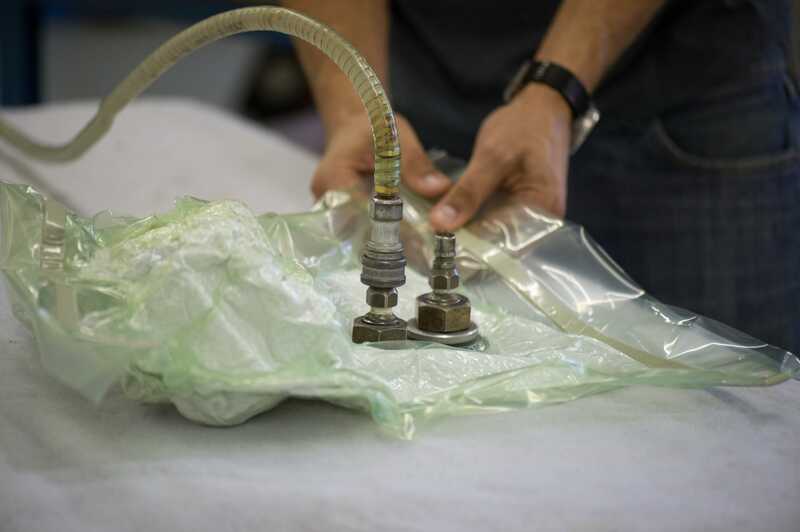 With a vacuum, the enclosed air is removed from the pressing molds wrapped in separating foil and bleeder fleece. 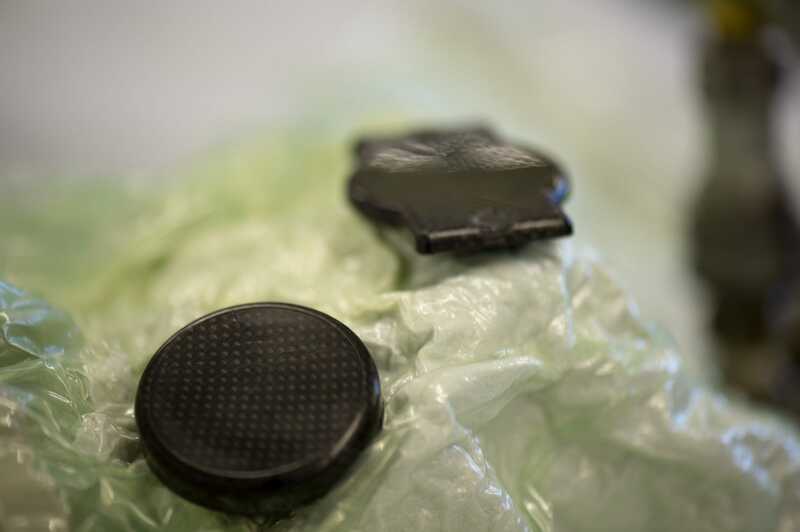 The carbon blanks for the case back and the bezel after the carbon mesh has been baked under pressure in the autoclave of the company HS-Composite. 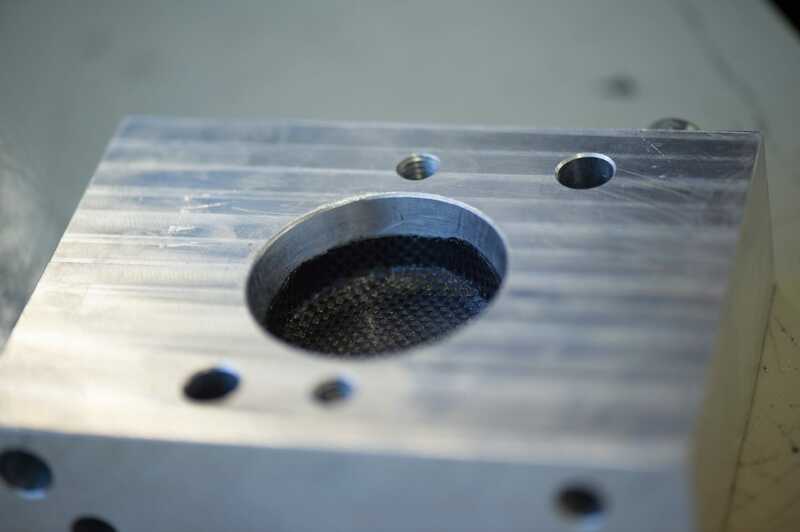 The carbon blank for the case back after it has been removed from the aluminum mold. The characteristic carbon pattern is clearly visible.